This MAb reacts with a 28 kDa chain of HLA-DRB1 antigen, a member of MHC class II molecules. This MAb reacts with a 28 kDa chain of HLA-DRB1 antigen, a member of MHC class II molecules. It does not cross react with HLA-DP and HLA-DQ. The L243 antibody recognizes a different epitope than the LN3 monoclonal antibody, and these antibodies do not cross-block binding to each other’s respective epitopes. HLA-DR is a heterodimeric cell surface glycoprotein comprised of a 36 kDa alpha (heavy) chain and a 28 kDa beta (light) chain. It is expressed on B-cells, activated T-cells, monocytes/macrophages, dendritic cells and other non-professional APCs. In conjunction with the CD3/TCR complex and CD4 molecules, HLA-DR is critical for efficient peptide presentation to CD4 T cells. 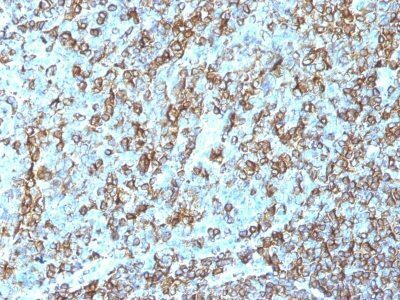 It is an excellent histiocytic marker in paraffin sections producing intense staining. True histiocytic neoplasms are similarly positive. HLA-DR antigens also occur on a variety of epithelial cells and their corresponding neoplastic counterparts. Loss of HLA-DR expression is related to tumor microenvironment and predicts adverse outcome in diffuse large B-cell lymphoma. 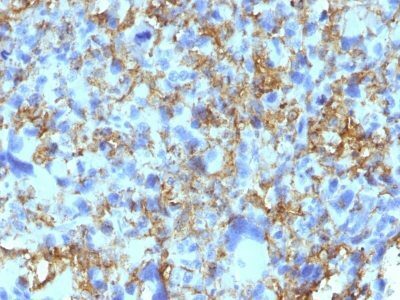 Catalog number key for antibody number 0057, Anti-HLA-DRB (LN-3) The prefix indicates conjugation, followed by the antibody number and size suffix.